Former Labour leader Neil Kinnock has given a stark warning about the re-election of Jeremy Corbyn. Speaking to the BBC's Panorama programme, Lord Kinnock said: "Unless things change radically, and rapidly, it's very doubtful I'll see another Labour government in my lifetime." Labour announces whether Mr Corbyn or Owen Smith have won the leadership contest in less than a week. Mr Corbyn insists he is "delighted" with the state of the party. Lord Kinnock, who led the fight against left-wing extremism in the 1980s, when Labour was paralysed by faction fighting, said: "Not just in my lifetime but stretching back to the 1930s, by any examination this is the greatest crisis that the Labour Party has faced." Mr Corbyn, however, appealed to Labour MPs in an interview to "come together" after the contest. And an extraordinary olive-branch to hostile Labour MPs after the rebellion of the summer, and the failed attempt to force the leader's resignation, has emerged. 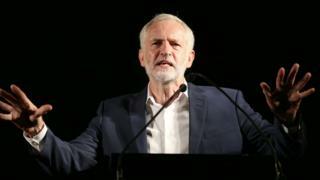 Mr Corbyn's closest friend and chief lieutenant at Westminster, shadow chancellor John McDonnell, said the Labour leader and himself were willing to take lessons in leadership. "Tutorials" from former senior ministers and shadow ministers would answer accusations of incompetence, improve their performance in the House of Commons and improve relations with Labour colleagues at Westminster. "A bit of tutoring from some old hands? ", I asked him. "Well, why not?" he replied. "Why not?" Panorama spent the summer with the rival pro- and anti-Corbyn factions in Labour's biggest local party, Brighton and Hove. The feuding there, and pressure from left-wing activists on the local MP, Peter Kyle, who is a critic of Mr Corbyn, mirrors the struggle taking place in many parts of the country. Image caption Hove MP Peter Kyle says the Labour party is "on the edge of a cliff"
There are accusations in Brighton, as elsewhere, of "entryism" - infiltration of the party by members with links to groups intent on pushing Labour further to the left. The local chairman, Mark Sandell, has been named as a supporter of the far-left Alliance for Workers' Liberty, and is under investigation by the national party. He told Panorama: "I don't see myself as an entryist. "The Labour Party was founded by some really great socialists who wanted to get rid of capitalism, who wanted to change the world." Mr Kyle is likely to face pressure from party members who want to sack him as a candidate at the next general election. He said: "I think we are standing absolutely at the edge of a cliff and it might well be that one or other of the factions, or both of us, end up going over it. "I really think it's that serious." The leadership insists it is not seeking to purge the party of hostile MPs by seeing them deselected as candidates by left-wing local parties. But the leader of the Unite union, Len McCluskey, told the programme: "I believe some of the MPs have behaved absolutely disgracefully and they've not shown any respect whatsoever to the leader. "They should be held to account." I asked Mr McCluskey if MPs who continued to be "vocal dissidents" if and when Mr Corbyn was re-elected would be "asking for it" when it came to the question of de-selection. He said: "I think they would. I think anybody who behaves in a way that is totally disrespectful and out with the culture of the Labour Party is basically asking to be held to account." After warnings and speculation Labour might split if Mr Corbyn is re-elected as leader, Labour MPs critical of his leadership have told me there is no appetite in the party for a schism, or any kind of organised break-away. Some MPs who resigned from the shadow cabinet in rejection of Mr Corbyn's leadership have told me privately they are contemplating a return. Mr Corbyn is said by his close allies to be willing to see at least a share of shadow Cabinet places allocated by a ballot of MPs. But senior former shadow ministers contemplating a return are clear they will not pledge their faith in his leadership or competence to lead a Labour administration in government. Mr Corbyn insists he is "delighted" with the state of the party and the surge in its membership. He says young voters and the less well off in society could propel the party closer to power, and he denies that the idea of relying on past non-voters to deliver victory in future is "pie in the sky." But there is no clear evidence Labour is prepared to reunite after the leadership contest. Without unity, and without reconnecting to the millions of voters the polls say have turned their back on the party, Labour seems destined to languish in the political wilderness, broken as a major force in British politics.